CKNW is reporting that "Surrey’s first supervised consumption site is set to open in two days and the media’s been given a tour of the new facility on the Whalley Strip. But the question on everyone’s mind is: will it reduce deaths, harm, and the number of discarded needles in the area? This is not the New York model. This is where harm reduction becomes harm promotion because they are throwing away the other four pillars. The DTES model is he wrong model to emulate. Just ask Dr. Colin Mangham. History has shown that promoting the drug trade with lethal injection sites has increased the number of drug overdoses because it fuels the forest fire of addiction instead of getting people into treatment. This is where corrupt politicians feed the pharmaceutical fraud with tax dollars. I object. Surrey drug rehab houses are flop houses for drugs to be sold. The only legitimate drug detox in Surrey is the John Volken society and they can't get government funding because the actually get people off drugs and teach them life skills. I kid you not. God Dam the pusher man. At least we now know who has Dwayne McDonald's hands tied and are preventing him from doing his job like Fraser MacRae did. It's the dirty politicians tied to the pharmaceutical fraud pushing harm promotion. Replacing an idiot with a good man will solve nothing if you tie his hands together and prevent him from do his job. the provincial government is not going to provide rehab for drug addicts because it costs too much. Its that simple. 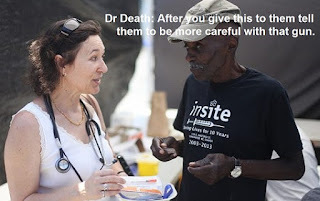 In my opinion they prefer they die and the injection sites without rehab will cause that to happen. Christy Clark and the b.c. lieberals have paid out $63M to their appointees but a nickel for rehab is a nickel too much. They won't support the Volken society because its successful and they can't make any money off of it. Were they a for profit organization which contributed to the B.C. Lieberals it would be another story. In Nanaimo we have the highest per capita rate of fent deaths. No help here either. As a matter of fact there is no help for any health issues. a disabled senior is sent home from hospital and they are on their own. No support, just a list of for profit outfits you can hire on your own nickel, and a whole lot more. If you can't afford it too bad so sad. Need your home cleaned because you're too disabled to do it, too bad so sad, not even a list of approved companies who you could hire. Need meals, too bad, you're on your own. turns about all funding for this has been cut by VIHA. Vancouver island health authority. So if this is how they are treating seniors, disabled, tax payers, etc. you can bet they won't be spending even a penny on helping those who need rehabilitation. people who are impaired because of fent. over doses are simply kept in hospitals or discharged to the streets. At some point the hospitals will be too full to treat regular patients and the ICUs too full of damaged fent. victims to deal with heart attacks, etc. welcome to the world of Christy clark and the b.c. lieberals.